I'm back from Cold Wars, I've unpacked, drooled over the small loot pile I brought home, so now I'm relaxing a bit before bed. I've started going through the photos. Some of the first are from the WAB demo games I ran Friday night and Saturday morning. It's been a while since I've done any convention or demo games, but it everything seemed to go pretty well. The players seemed to enjoy themselves - though in each game there was one person who got a bit screwed by position or the dice. (I felt bad and tried thinking of a way to "bend" the rules, but didn't want to then upset the opposing side. A bit of a dilemma.) In both games the players all picked up the rules pretty quickly. I probably could have stepped back and let them play the game themselves, and just hung around to answer questions. But my convention game "policy" is to keep the game moving at a steady pace by running through the turn phases and keeping people motivated. In this case it meant that we more or less finished each game to a discernible conclusion in three hours, even with me explaining the rules for part of the time slot and all the players being new. I didn't exactly calculate the points, but the armies had to have been over 2500 points. It hit me, as one of the games was going on, that these demo games summed up a lot of what I like about WAB. One, it's easy to pick up, as I mentioned above. Two, it's a fun game. With eight players, everyone was moving figures, rolling dice, and joking around for the bulk of the game. I hate those games where you're stuck waiting around doing nothing for 20 minutes, or have to constantly dig through rulebooks & charts. Three, even new guys can play a decent sized game in just a couple hours. And four (and I will actually take partial credit for setting this particular game up this way) it can frequently look like what I would imagine an ancient battle to generally look like. And even play out in a generally historic way, for that matter. There was no scenario, just a straight forward fictitious battle. The setting was the Cimbric War, so it was Marius era Romans (plus some allies to spice things up) against a mixed German & Gallic army. The battle lines approach each other, Romans on the left, Germans & Gauls on the right. The flanks were the first to engage. In the foreground a unit of Roman allied Gallic cavalry first engaged some German cavalry and chased them off, resulting in a second battle between the Gauls and the German infantry backing up their cavalry. The German warband's victory sent them impetuously pursuing far forward, and getting flanked by the Romans on the hill. Surprisingly, they held! Valiaint as their stand may have been, the Gauls eventually rallied and came back a few turns later to turn the tide of this flank. On the far flank, the Germans fared better. They managed to catch the Roman allied Numidian cavalry who had been harassing them with javelins. Using this area of victory to their advantage they started to press the advantage by pressuring the legionary line. Romans, being as flexible as they are, managed to respond in time. The furthest legion was defeated, but not before they were entirely surrounded and held out for several rounds of combat. It took a little while, but the main lines eventually clashed. The Roman center held against the initial charge of Germans and Gauls, and pushed them back. 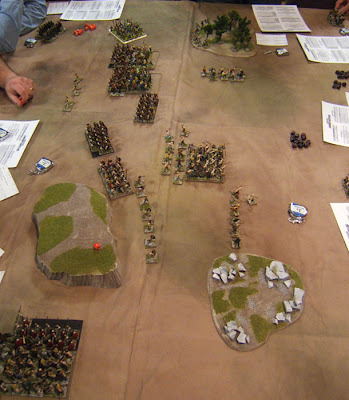 This gave them the breathing room they needed to deal with the far flank, as well as re-deploying the legion and allied cavalry on the near flank once those troops had dealt with the stubborn resistance of the isolated warband. 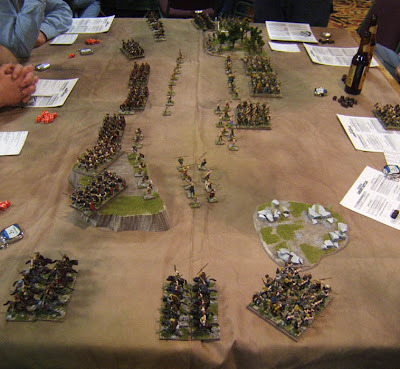 The Romans ended up occupying the center of the table, with barbarians on both sides, but had the advantage. The barbarians had lost the initiative and the advantage of numbers. The game ended in a minor victory for the Romans.